David John 'Dave' Sampson was born 9 January 1941 at Uttoxeter, Staffordshire, England. Dave Sampson formed his first skiffle band in 1957 with Martin Murray (later of The Honeycombs). 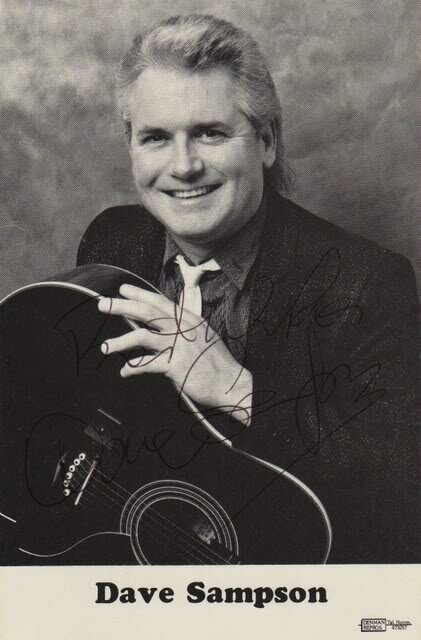 He moved on to play in various bands on the London rock'n'roll scene, notably The Parker Royal Four which included some schoolmates of Cliff Richard. After meeting and performing with Cliff and The Shadows, Dave wrote the song "Sweet Dreams" with Cliff in mind, but producer Norrie Paramour ended up signing Dave to record the song himself. "Sweet Dreams" became a UK hit single in May 1960 for Dave Sampson and his backing band, The Hunters, which peaked at number 29 on the UK Singles Chart. "Sweet Dreams" was released on the Columbia Records label, and spent six weeks in the chart. His first ever recording was a four tune extended play demo disc with Steve Laine later of the Liverpool Five. Both Dave and Steve were the singers with a band that never was named . Dave lived near Cliff and and went to his front door and asked him to listen to this self penned track 'Sweet Dreams' , he soon ended up at Columbia records where he gained a contract ! Dave Sampson & the Hunters made five singles and an EP in the early '60s that were very much in the Cliff Richard & the Shadows mold, with their imitation of the tamer elements of Elvis Presley and Ricky Nelson, as well as the cleanly echoing, almost surf-Hawaiian sound of the guitars. 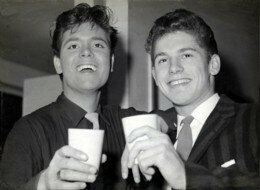 Dave Sampson with Cliff Richard in 1960. The Cliff Richard comparison did not arise from coincidence, as Dave Sampson got his EMI contract with Cliff Richard's help. Dave Sampson's debut single, "Sweet Dreams," got into the British Top 30 in 1960, but none of his subsequent efforts charted. 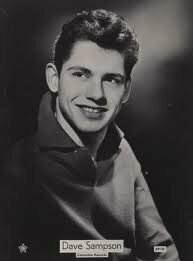 Dave Sampson wasn't without his virtues, he wrote a couple of his singles, including "Sweet Dreams," and had occasional brushes with a polished rockabilly sound. During the 1960s Dave toured with a number of British pop stars of the day. 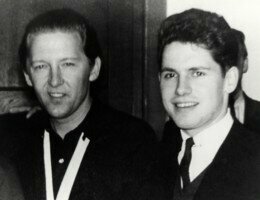 As well as Cliff Richard and the Shadows, they included Billy Fury, Marty Wilde and Joe Brown. From 1963 he worked in Hamburg at The Star Club and The Top Ten Club along with The Beatles and other international stars including Jerry Lee Lewis. Dave Sampson & The Hunters sings the Pomus/Shuman song, "If You Need Me". 1960. Sounding rather like Cliff Richard and the Drifters (Shadows). Yet on the whole, his talent was only passable, and much of the material he was given was too innocuous to make a lasting impact before his last single in 1962. A recent highlight of Dave's career was his 2005 appearance with the legendary guitarist James Burton in the Ricky Nelson tribute show, Remembering Ricky. Dave has also made several appearances via the 2i's Reunion at the 100 Club in Central London. He also appeared to an audience of Teddy boys at The Pavilion pub in Battersea organised by the International Edwardian Teddy Boy Association in 2010 in which he appeared with Clem Cattini and Cliff Edmonds in a session band called "The 2i's Boys".